A few months ago I made the difficult decision of emailing my hairdresser to let her know I was breaking up with her. It wasn't because I was unhappy with her work -- quite the opposite -- but she had moved twice within the past year, eventually opening up her own salon in a town that simply felt too far away for me to drive to for a haircut. I wished her good luck with the new business venture and thanked her for all of the awesome styles she gave me through the years not to mention all of the times she patiently listened while I cried in her chair over a dope that broke my heart. I just couldn't justify paying $57 (before tip) for a haircut that I could do it myself. I realize that's a bargain compared to what salons in the city charge, but now that my former stylist is the owner of her own business, I'm sure that rate has gone up. My hair is pretty uncomplicated; I have a shorter version of Mary Travers' trademark 'do...slick straight, one length hair except for some face framing layers with bangs. Even when I was working, it kind of pained me to fork over a chunk of cash every six-eight weeks when I was just getting a trim off the bottom of a very simple hairstyle. Granted, if I ever decide to change it significantly I won't attempt it myself; I'll find a salon. But for now, I'm happy with saving a few extra buckaroos every other month. And is it just me, or does it seem that hair salons in general have gotten way too expensive and pretentious compared to back in the day? There's about 82,000 beauty salons in the U.S. today and when combined with 4,000 barber shops (only 4,000?) they pull in an annual revenue of over $20 billion. These stats are from 2014. I do not know how much this industry has grown since, say the 1970s, but I'm sure the answer would be "quite a lot." It's a saturated market. In my town alone, doing a quick search, I counted at least a dozen. 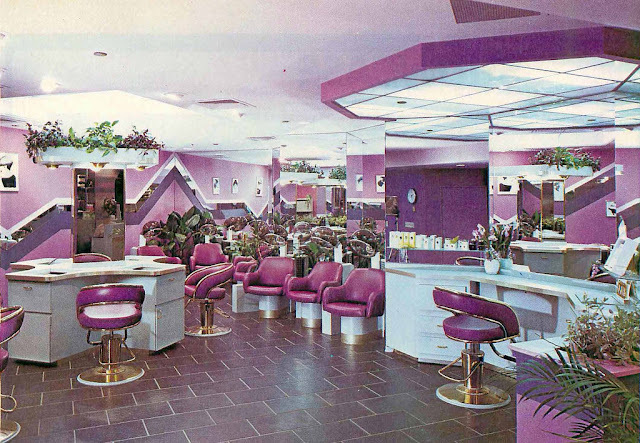 Don't get me wrong; I have nothing against hair stylists and salons; I respect the amount of training and skill development that goes into becoming a licensed hairdresser (that is the retro word I grew up hearing and still use to this day.) I have a family member in the business that's done quite well for herself; she now owns her own salon and is renting chairs to other stylists. But it's the salons that charge a fortune for a snip and put on airs that just make me scratch my head. While doing a search for salons that earned the "Best of Boston" award, I came across one that actually charges up to $250 for a cut. This same business also offers male clients an annual membership for $1,000 where they can receive unlimited haircuts. Since most people get their hair cut every six weeks, that amounts to about eight times a year. $1,000 divided by eight is $125 per haircut. I don't see how that's a bargain. And like I said, that was for the male clients. Gentlemen, do yourselves a favor and just find a really good barbershop. You'll save yourself a small fortune. Barbers don't buy into such foolishness. And here's the images that one salon -- which I assume wants its clientele to think of them as trendy and artsy -- uses on their homepage, with NO other info whaosever. A little help, here? I don't understand what I'm looking at or what is so remarkable about these cuts. The fact that they posted them in black and white just makes this place seem all the more cold and aloof. This is supposedly one of the most expensive places in Boston to get a haircut. And why is it that these male salon owners and top stylists today usually don't have a haircut themselves, but just wear their hair long? Maybe it all started with celebrity stylist Jose Eber in the '80s...remember him with his long, straight hair and cowboy hat? Like so many of you out there, I've had my share of bad haircuts as well, and not necessarily from budget haircutting franchises like Supercuts (although Supercuts once botched my hair so badly by literally cutting a hole into one side of the front layering I have...I had to see another place to get it chopped into a short bob, after I'd spent months growing it past my shoulders.) It was another incentive to learn how to trim my own hair. After the Supercuts fiasco, I continued to see the new stylist -- a woman that had been featured in a Boston magazine for her skills -- until the day I showed up to find what I assume was her very immature boyfriend sitting and spinning around in the chair next to mine and goofing off. She barely acknowledged me at all during the appointment. She was so focused on him that she actually missed some spots at the bottom of my hair. This was the second time I noticed uneven ends; at home after the last cut, I had to fix them myself. When I pointed out the very obvious longer pieces hanging down, she got huffy and evened them out without a saying a word or apologizing. Needless to say, I never showed up for my next appointment. Another top salon in my town once gave out gift cards at a local event I attended, so I tried them out. The stylist I got turned my chair at a 90 degree angle so instead of looking into the mirror and seeing what she was doing, I was forced to view a male client in the chair next to mine. She had the personality of a styrofoam plate and the only times she spoke was when she attempted to talk me into trying whispy ends and other techniques that I had already tried years ago that I know my fine, straight hair doesn't really cooperate with. I also color my roots myself every six weeks or so with Schwarzkopf Keratin Color; my local paper usually provides regular coupons, whereas L'Oreal stopped giving them for Feria (my previous preferred brand) and also discontinued their online rewards program. Again, the cost of going to a salon to have your hair colored seems astronomical, and I can't imagine repeating the price several times a year as the roots grow in. As it turns out, however, charging a fortune for a haircut is nothing new. In 1968, Roman Polanski paid Vidal Sassoon $5,000 for him to fly to the set of Rosemary's Baby and give star Mia Farrow a pixie cut (husband Frank Sinatra supposedly was not a fan of her boyish new hairdo.) But he was Vidal Sassoon...a man that started a hair revolution in the 1960s by rejuvenating the flapper bob with angular and asymmetrical shapes, but somehow still creating styles that women actually wanted to wear. And at the end of the day, I think most women today want low maintenance hair and something that just looks natural and compliments their face. So in the meantime I'll take my chances trimming my own hair. And my old hairdresser? She never responded to my message. Shrug. Pam I'm in shock--I had just started a new blog this morning about my personal history with haircuts (after getting a really bad one yesterday at a different barber in town)--and then I get online & see this! Anyway, enjoyed reading your story here, thanks for sharing. Though I wasn't surprised at what you have to shell out for a cut--I have 3 sisters who tell me what they pay, it's unbelievable (and seems pretty sexist, if you ask me). If you can do it yourself, good for you! Hi Doug - I look forward to reading your new blog post! And you actually just reminded me, I knew there was something missing from my post, so I amended it just now with a few paragraphs about bad haircuts and unprofessional service I've received through the years. Yep, if you can do it yourself I highly recommend it...there's one woman on YouTube who's pretty amazing; she's done everything from cut amazing layers into her long hair to cutting it into an A-line bob. I bet there are men that demonstrate cutting their own hair as well. Wow, you struck a nerve with this one. You had me laughing and cringing. And I've been there, too. I also have fine, blonde hair. It's so easy to screw it up. I have many horror stories. Just like you, I've had people try to give me wispy ends and "cut into" my hair thinning out my already fly-away hair. There just aren't a lot of "professionals" out there who know how to cut fine hair. And if I have one more of them look at me, wrinkle up their nose and announce, "Your hair is so fine." Gee... thanks for the newsflash, and I don't need the opinionated facial expressions. Most of the time my hair looks finer than it is, or even damaged, because of some horrendous cut they gave me. What really sends me over the edge is when they do something without asking. I am currently growing out a short haircut I didn't ask for. And, yes, the prices! Why? It's ridiculous. And then they expect a tip. A tip is for above and beyond service. I haven't had that kind of service for my hair in a very, very long time. So, I resent the expectations. You are so lucky you can cut and color your own hair. And you obviously do a good job. I have highlights in mine, so I don't know if I would be capable of doing that. Plus, I want to be very careful not to damage it. What's the woman's name on YouTube who does the instructional video? I'm willing to give a cut a shot. If you have any other tips on things like doing your own highlights, let me know. Thanks for posting this. Jeez! This was therapeutic. So sorry for the long post. Hi Dana -- I can relate! It's hard to explain, but the "hole" I got from Supercuts that time really did look like a hole in the angled front end. It was awful. The girl I got clearly didn't know how to cut face framing angled fringe on the very front of hair and ended up hacking off a chunk of hair...the new stylist I went to (she was the one I initially loved but eventually quit seeing because she talked to her boyfriend instead of me while she's trying to cut my hair) couldn't believe it and unfortunately the only remedy was to cut it all into a one layer chin length bob after I had just grown out that very style! At least hair grows back, but I NEVER went to another Supercuts ever again. Funny you mention the tipping...one thing I don't like is when the salon has someone just to wash your hair so you end up tipping them plus giving the stylist the tip when honestly, I feel the one cutting your hair should be the one to wash it. P.S. I use an all-over permanent hair color, and haven't done highlights for many years...but I do like the Schwarzkopf Keratin hair color (it's made in Germany but has just started to be sold here...so far the only drugstore near me that carries it is CVS.) I also use a shampoo and conditioner just for blonde hair, called Sheer Blonde (made by John Frieda.) I find these products really bring out natural looking highlights in my dyed hair. As you have blonde hair you may like them. Thank you for the link! I'll check out several videos and do some research. Maybe I can find some on highlights, too. I'm so glad you wrote this. I feel like I had a therapy session..haha. Cool, Dana -- glad I could commiserate with you! Hope you find some useful videos on YT! Gee, Pam, I can relate to what you posted here, though I am male. I don't blame you for giving up the $57 charge before tip. I started cutting my own hair three years ago because of the cost. And I can do the job better than the place I used to go to, because, after a few beginner attempts, I have become expert at cutting my hair exactly how I want it. I don't have to go and see someone who'll cuts my hair in the generic way they have been trained to do so. Maybe someday I'll go back to a barber, but not until I get totally fed up with having to clean up the mess afterwards, and decide to spend the money again for the convenience. I am a guy and I can relate. My hair is long and while I can't cut it myself I used to color it myself because one time a hairdresser colored it "pink" on accident. I argued with her that it was coming out pink and she said that I was wrong until I got home and had to take a crash course in fixing it myself and from then on I was doing it myself. Only recently I've had to go back to have it done by a pro and I can't believe how much it costs now. I may or may not keep going but for some reason it seems the grayer I get the less the hair color off the shelf seems to last and I've been trying a bunch of them and for now the salon stuff/procedure seems to last a lot longer. I don't feel so bad about my wife only spending ~$70 for a cut and color now. The downside to her stylist however is that they don't take appointments, everything is walk-in only. If you don't get there right at opening, you'll be waiting hours. We save some money by sometimes coloring her hair at home, a task I've gotten pretty good at doing for her, at least she thinks so!